Dispatch information is presented on the web shop product detail pages, in the form of a traffic light system which provides an indication of estimated dispatch times. For in-stock items, the number of units available are clearly displayed. Online stock information & estimated dispatch times. 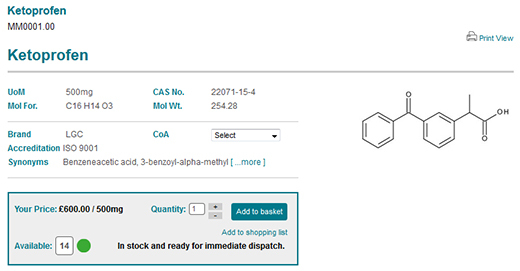 Amber Not in stock but Good availability. Dispatched within 5-10 days of order. Red Not in stock. Please contact your local sales office for delivery information. Availability information is up dated online every two hours. LGC will ship the shortest expiry Lot No available (where applicable). 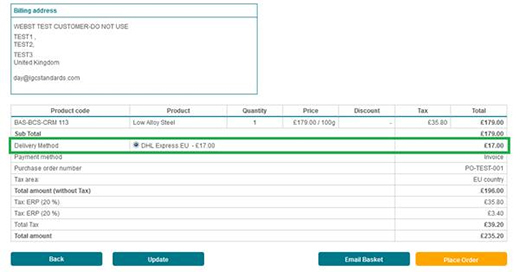 The web shop will automatically calculate your shipping charges on the final order confirmation page. These shipping charges take into account the composition of your order, your account details and delivery address selected to provide you with your correct shipping charges. The shipping information will include the carrier, the shipping charges and the sales tax (if applicable) on the order. Where an order does not have shipping charges please call your local sales office, or place your order and a member of our customer service team will contact you to confirm your shipping charges. The status of your orders in progress and with carriers can be tracked 24/7 in your order management section.